Sequestration is the series of blunt, across the board cuts that go into effect March 1 and will shrink the size of the federal government over the next 10 years. Several states will lose hundreds of thousands of jobs, the price of groceries could jump following USDA inspector furloughs, and the Congressional Budget Office reported that the austerity measures could initiate a recession. What’s more, sequestration accomplishes a pathetic amount over 10 years, all things considered. 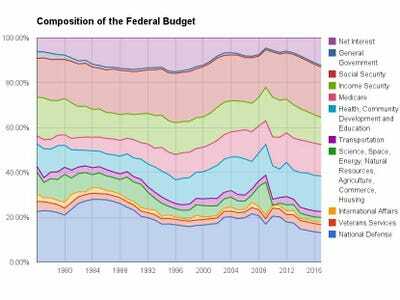 It was designed to cut spending on things that constitute core government functions — money for infrastructure, schools and national defence. Social Security, Medicaid and many income security programs are untouched, and the per cent sequestered from Medicare is very low. The spike in early 2009 — mostly in the green Sciences/Energy/Commerce line — is the impact of the stimulus package. The bottom two lines are defence spending. They’re dominated by the blue spending on the military and homeland security, but there’s an increasing proportion of funds devoted to veterans services following a prolonged war. The blue, purple, green and yellow lines are the non-defence aspects of the government — education, road building, NASA, State Department work, etc. From 2012 onward, the defence and non-defence spending is decreasing as a result of a direct hit from sequestration. 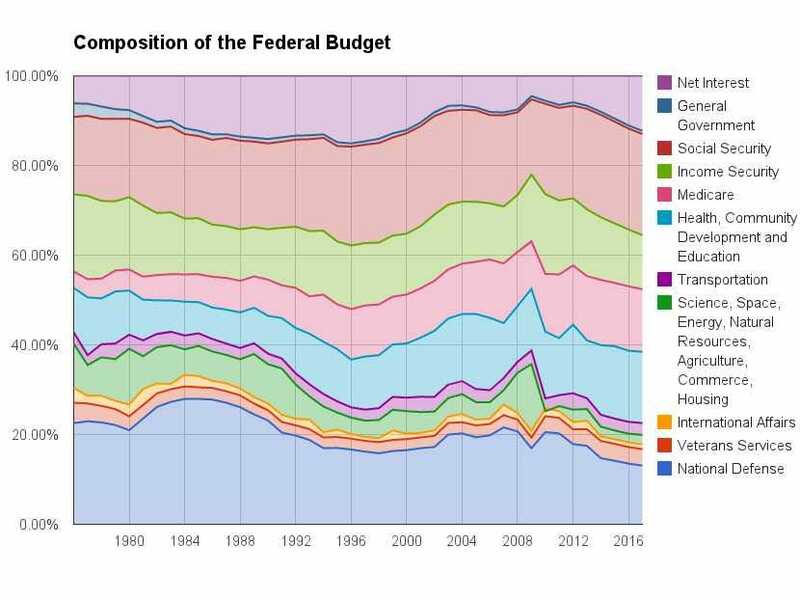 The point is that, as a result of sequestration, the government is spending a smaller percentage of its money doing typical “government” things — roads, troops, etc. — and more money paying off loans and running income security programs. In 2017, for the first time since the surpluses of the 1990s, the government will be spending less than 40 per cent on typical government stuff, and more than 10 per cent paying down interest on the debt. 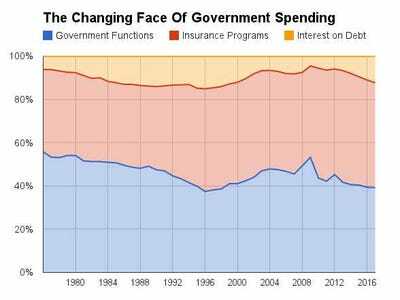 The government will also be spending close to half of the budget on what are essentially insurance programs — income insurance for the elderly with Social Security, poverty insurance in the form of Medicaid, SNAP and other safety nets, and heath insurance in the form of Medicare. 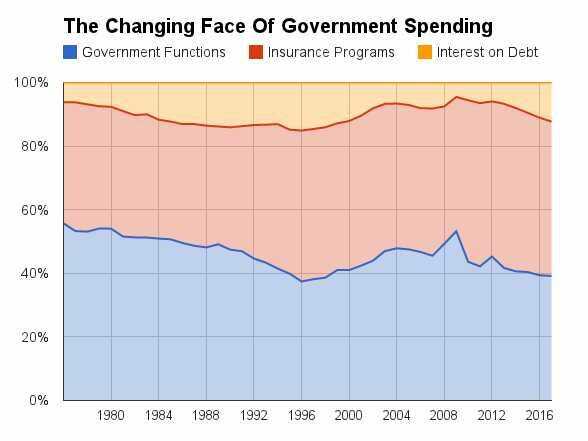 Much of this has been in the making for a very long time, but it’s nonetheless striking to see the trajectory of what the government in fact does following cuts to typical government functions. Source of the data is Table 5.1 at OMB’s historical tables.